Follow @ProPublicaIL on election night for live coverage and analysis. On many issues, they share nearly identical positions. 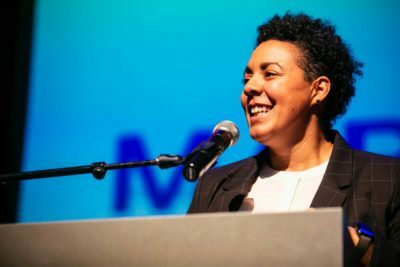 Both Lightfoot, an attorney and first-time candidate, and Preckwinkle, the Cook County Board president, present themselves as progressives who will focus on safety, schools and jobs in the city’s neighborhoods. Both say they’ll address the needs of South and West side communities desperate for investment as well as rapidly gentrifying areas extending from downtown where housing costs are soaring. 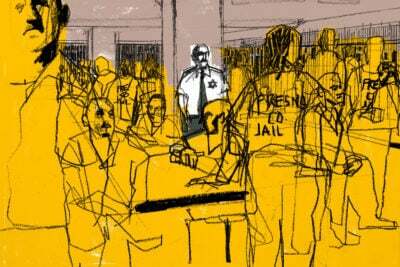 But voters are demanding a change after eight years under Emanuel and 22 years under his predecessor, Richard M. Daley. In response, the two candidates have tried to cast each other as part of the city’s political machine. Lightfoot has hit Preckwinkle for chairing the Cook County Democratic Party and receiving fundraising help from Alderman Ed Burke, who was charged in federal court in January with attempted extortion of a Burger King franchisee in his ward. For her part, Preckwinkle calls Lightfoot “the ultimate insider” for accepting appointments in the Daley and Emanuel administrations. To get an up-close glimpse of how the race was unfolding, I asked both campaigns if I could hang out with them for a bit. Aides to Lightfoot invited me to follow her to several get-out-the-vote stops, while Preckwinkle’s team scheduled me for an interview at her campaign headquarters. Lightfoot then led the room in a chant of “Sí Se Puede,” or “Yes, it can be done,” a longtime activist and civil rights rallying cry. Lightfoot’s critics on the left say her record is anything but progressive. 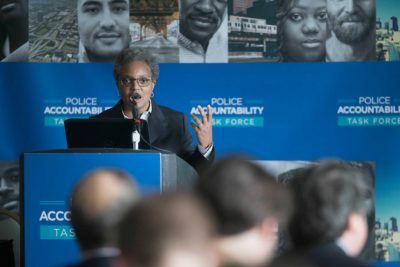 A former federal prosecutor, Lightfoot was appointed by Daley to lead the Office of Professional Standards, which oversaw police accountability from within the department, and then was picked by Emanuel to preside over the police board, which reviews police discipline cases. She repeatedly failed to hold officers accountable for misconduct, her critics charge, with some going so far as to say she’s essentially a cop herself. Lightfoot counters that she worked to change the system from within. 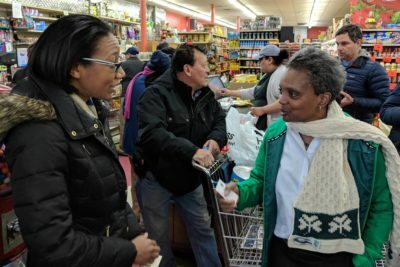 Lightfoot stepped into a supermercado, where shoppers and employees stopped what they were doing while she introduced herself and shook hands. 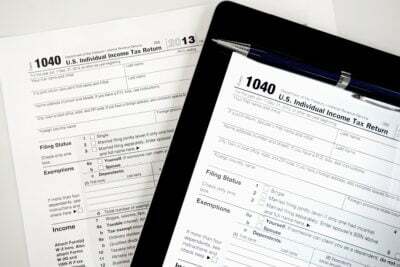 A cashier explained who Lightfoot was to her customers. Right. This being an actual election, the voters have to weigh in first, and Preckwinkle vows it’s not over. During much of the mayoral race, Preckwinkle has seemed defensive, evasive and scripted, even reading talking points from her notes during candidate forums. 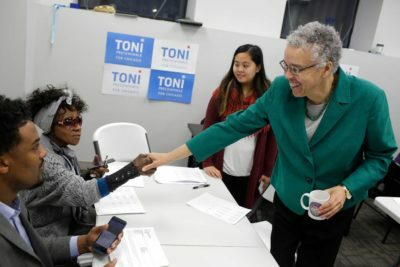 But when I sat down with her last week at her River North campaign headquarters, Preckwinkle resembled the blunt, confident politician I’d interviewed in the past — including her first two terms as county board president, when she focused on repairing county finances and addressing racial disparities in the criminal justice system. I suggested she had been playing defense since the revelations about Burke and his fundraising effort for her, and the campaign had not gone as she’d expected. “That is an understatement,” she said, and then laughed. 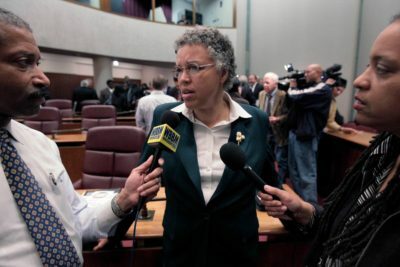 Preckwinkle noted, as she has before, that when she served as an alderman from 1991 to 2010, she had an independent record. She was not friends or allies with Burke, who helped advance Daley’s agenda while Preckwinkle often opposed it. But it’s not clear if that part of the story ever sunk in with voters. When I asked how the city would find the resources to rebuild areas in need, she — like Lightfoot — didn’t have specific answers. But Preckwinkle said her record as alderman and county board president shows she can get things done. Both Lightfoot and Preckwinkle have said they’re opposed to current proposals for a taxpayer subsidy of as much as $1.3 billion for Lincoln Yards, a development along the North Branch of the Chicago River with 6,000 planned housing units. Lightfoot vowed in a recent interview to hold up payments for the project if the City Council approves the subsidies before the new mayor takes office in May. Preckwinkle said she too would like to slow the project. And that’s when things get truly interesting: After months of visiting neighborhoods around the city, the new mayor will have to start showing she can fix them, too. In the 49th Ward, a newcomer from the left unseated the once progressive Joe Moore. 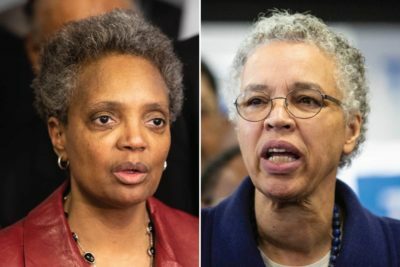 And mayoral candidates tried to distance themselves from Rahm Emanuel, although the two top finishers have their own ties to the political establishment.